Heat the oven to 375 degrees F. Line a sheet pan with parchment paper. Carefully unfold the chilled puff pastry sheet onto a lightly floured work surface. Cut the puff pastry in half, and re-wrap the second half for another use. Roll the remaining half sheet of pastry out into an 8×13” rectangle. Carefully transfer the rectangle of puff pastry to the parchment-lined sheet pan. Use a sharp knife to score a ¼ -inch border around the puff pastry (do not cut all the way through). Place the sheet pan in the fridge or freezer for 20 minutes to harden the pastry dough. While the crust hardens, mix together the mascarpone, herbs de provence, and a pinch each of salt and pepper in a small bowl, until fully combined. Set aside. Drain the pears and slice them once lengthwise, so you essentially double the number of pears. Once the dough is good and chilly, remove it from the fridge or freezer and place it back on your work surface. Spread the mascarpone cheese mixture evenly on the tart dough, leaving the crust bare. Arrange the sliced pears atop the cheese, either haphazardly or in your favorite pattern, until the mascarpone mixture is completely covered. 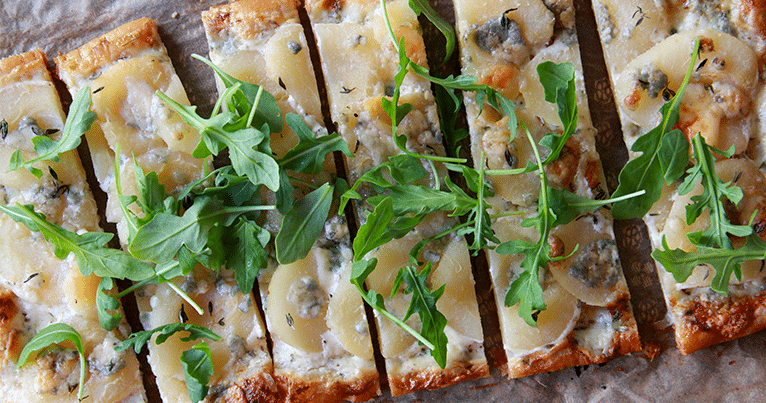 Sprinkle the crumbled gorgonzola and thyme leaves atop the pears, and finish with an extra pinch of salt and pepper. Brush the crust with the prepared egg wash. Bake the tart 30-40 minutes, until the crust is puffed and deeply browned and the cheese is melted. Allow the tart to cool slightly before scattering some fresh arugula on top, cutting into squares and serving, either warm or at room temperature.